Note from shop owner I will be taking a medical leave of absence until May 31st, 2019. All current orders have been shipped and I look forward to adding new vintage items for you upon my return! I will be taking a medical leave of absence until May 31st, 2019. All current orders have been shipped and I look forward to adding new vintage items for you upon my return! Fast shipping and in amazing condition I’m so excited so thank you!!! Thanks for having this available and I was happy to have the back story of how this little sweater traveled in your family. It’s why I love vintage things: fun to imagine who wore the item, the history behind it and you provided the details! Carefully packaged and prepared with quick shipping- Thanks again! Exactly what I was looking for only better! Packaged with lots of care & shipped super quick. Thank you. 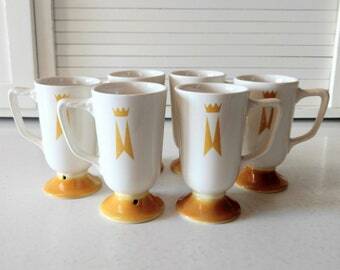 Vintage Christmas coffee mugs by Pfaltzgraff in collaboration with Marimekko Oy! My journey on Etsy started in 2007, when Etsy was the “new kid on the block”, in the world of online selling. I originally designed and made tote bags made from vintage fabric and table cloths, occasionally selling unique vintage finds. These days my health doesn’t allow me to spend hours cutting and sewing so my focus is vintage clothing and home goods. Originally from Indiana, I named my shop Back Home Again to pay homage to the home land. I now live in the beautiful foothills of the Rocky Mountains in Colorado. My most prized possession, other than my family, is my Russel Wright American Modern collection by Steubenville. I’ve collected Russel Wright for many years and continue to hunt for coveted pieces. Selling on Etsy has been a great experience because of the wonderful customers and fellow sellers. I love connecting with people from all over the world and all walks of life. My passion towards collecting and selling vintage clothing and home goods is overshadowed only by my passion for customer service. Welcome to Back Home Again where you'll find a delightful assortment of handmade goods and vintage items to remind you of the joy and comfort of being.... Back Home Again! *Byers are responsible for return shipping costs. *Tracking must be included on all returned items. *Items returned must be in original condition. *If insurance was included on the original shipment, insurance must be included on return shipment. I include insurance on most of my shipments. *Items must be appropriately packed to reduce risk of damage. *If these conditions are not met, the return will not be accepted. If your item is delivered damaged please do the following within 3 days of delivery. *Contact me via the Etsy covo system. *Don’t remove the item from the original box. *Send me a photo of the broken or damaged item. *Send me a photo of the box the item arrived in. PayPal payment is expected within 3 days! If you pay with a PayPal e-check, We will wait for the check to clear before your item is shipped! Check or money order is expected, in our hands, within 7 days! We will deposit upon receiving and a check must clear the bank before your item is shipped. We also understand that people change their minds... If you make a purchase and do not want to pay because you have changed your mind, please let us know. There's no sin in being human and changing your mind. Please just communicate! We are a small business, not Amazon, so we don’t offer free shipping. It’s impossible to accurately calculate shipping, especially when you order multiple items. That’s why I refund shipping overages over $2. For the most part we ship USPS with delivery confirmation. For larger or heavier items, we ship Fed Ex Ground. We are currently shipping on Mondays, Wednesdays and Saturdays. If for some reason we are unable to ship on these days, I'll be sure to let you know. Got any other shipping questions, just message me! We currently offer limited international shipping to Great Britain, Australia and Japan. Our business is smoke-free and your vintage or antique item has been stored carefully. However, our animals (Dog Rex, Cats Rory and Sally) roam freely. So if you are highly allergic to cats or dogs, please keep this in mind. Back Home Again is an Eco-friendly business and we do our best to cut down on packaging, mailing materials and trips to the post office. * We use recycled and reused boxes, nuts, bubble wrap as much as we possibly can. We are successful about 95% of the time. *Our kids bring an unbelievable amount of paper home from school. We shred it and use it for packing. *We use rechargeable batteries in our camera to cut down on batteries in the local land fill. If you take a look and have any suggestions on how Back Home Again could be greener, We'd love to hear from you!